On Saturday, M. and I ventured on our weekly food shopping journey to Whole Foods. My husband requested wings for Superbowl Sunday and Whole Foods was having a sale, so M. and I did our shopping, then grabbed a bucket and filled it up with three different types of chicken wings. I love Adam Levine. Especially smiling, happy Adam Levine in a black tee shirt. How can I walk past that picture without picking him up? Look at how he’s staring at me, Blogtropolis! 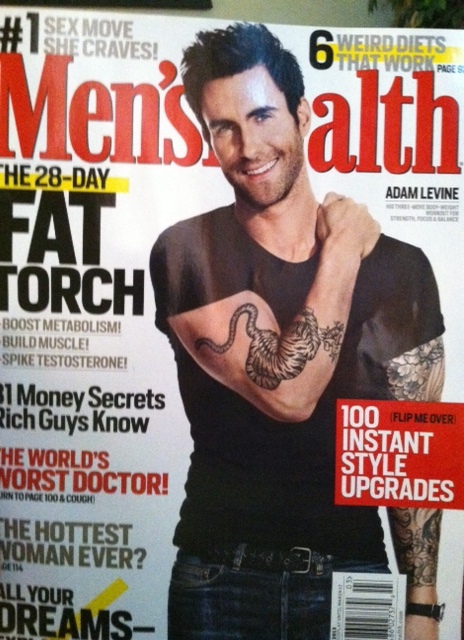 Ignoring that I had already grabbed myself some Gluten Free Double Chocolate Muffins, I decided that I would splurge and buy Adam/Men’s Health as my Superbowl Treat. I took a magazine from the back of the rack (I wanted an untouched copy) and carefully placed it in a special spot in the cart where I knew M. wouldn’t bother it and it wouldn’t get chicken wing residue or any other food substance on it. Adam was now in my cart, on the way to my home. M. and I always pick the wrong line for the check out. It’s a talent we have. Some force beyond our control sees the two of us together, with M. losing his patience and me losing steam, and punishes us by sending us to the aisle where the register tape needs changing, the cashiers are switching shifts, or the lady in front of us needs price check after price check. At Whole Foods on Superbowl Saturday, M. and I picked the check-out with the Senior Citizen cashier who formed friendships with all of the customers. As I unloaded the cart (tenderly placing Adam on a dry, clean plastic tub of lettuce– organic of course– it is Whole Foods), Senior Citizen Cashier “Jeff,” according to his name tag, exchanged recipes with the woman in front of me. I didn’t get upset, since I knew this was solely the result of the universe reinforcing the talents of M. and I to find “this” line. I just sighed and waited and watched the perishables start to perish as Jeff jotted down his turkey chili recipe. Finally, Jeff turned to me and greeted me like an old friend, and started the conversation with a comment on the fish I had bought. Within the time it took for five items to be scanned, Jeff had elicited that I did not eat fish, was gluten free but not vegetarian, and bought the chicken wings for my husband as a special treat to eat during the Superbowl. Then he got to Adam. He scanned him and placed him up on the ledge by the credit card machine. Jeff: You know, people often mistake me for Adam Levine. Me: Yeah, I can see that. I was going to ask you to sign it for me. Jeff: I have tattoos like that too. Jeff: Is that for your husband? Me: Nope. It’s a treat for me. Maybe I’ll let him look at it. Jeff: So it’s your bucket of wings. Adam Levine was my bucket of chicken wings! Jeff was right. At home later, when I explained to my husband why I bought Men’s Health magazine, I told him “it was my chicken wings.” He didn’t get it, had no idea who Adam Levine was, and pointed out that the wings were on sale. “Forget it,” I told him, puzzled that hundred-year-old Jeff knew who Adam Levine was but my husband didn’t. Husband asked me if Adam “was in a band,” then sat down and flipped through the magazine before I had the chance to check it out myself. Huh? I had no idea. Sure enough, the article in Men’s Health centers around Adam’s devout yoga practice. He’s been practicing for years, has his own trainer, and even does yoga for an hour before each show. A couple of lovely pictures of Adam in different poses grace the pages. If you’ve read my blog, you know that yoga is becoming a part of my life too (see here and here). Don’t Adam and I have so much in common? I wonder if he’d be interested in a mom who wears “Not Your Daughter’s Jeans” jeans and drives a minivan? Maybe he’s sick of models, right? Okay, perhaps he’s not quite ready for someone as mature and wonderful as me. In the meantime, while Adam goes through his “models stage” dating the actual wearers of the “Yes these Are the Daughter’s Jeans” jeans, I’ll just admire his picture on the cover of my “bucket of wings” magazine and dedicate my yoga practice to him at my next class. Maybe he’ll feel my positive vibes and send some back my way. I admire your love for AL. He sadly is on my shortlist of dudes that I would love to throat punch…lol. I guess it’s how he trys have an edge, when really he is an auto tune poser BUT I can see why the ladies like him….very funny post! go search adam levine yoga in youtube. There at least used to be a few videos of him over there 😉 from a fellow Adam Levine lovin yogini!